lot of pumpkin, and really loved the results. 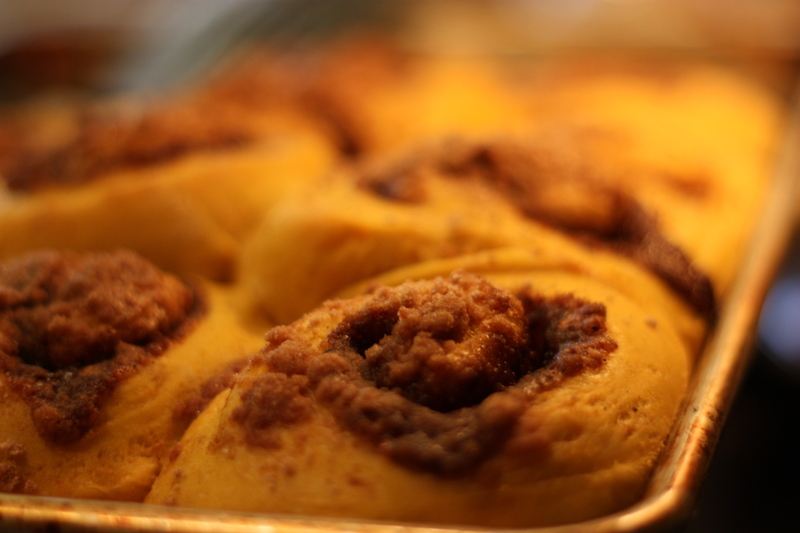 It has the softness that sweet rolls made with potato have, but the spice filling is remarkable. I topped these rolls with a drizzle of icing, mostly for appearance. Alternately, you can make this dough into a loaf of swirl bread, which I haven’t done, but I’m sure it would be fantastic. 1. In a small bowl, sprinkle the yeast and the pinch of sugar over the warm water. Stir to dissolve. Let stand until foamy, about ten minutes. 2. In a large bowl with a whisk or in the work bowl of a heavy-duty electric mixer fitted with the paddle attachment, combine the warm buttermilk, pumpkin puree, the 3 T. sugar, oil, egg, orange zest, salt and 2 c. of the flour. Beat until smooth, about 1 minute. Add the yeast mixture and 1 c. more of the flour. Beat 1 minute longer. Add the remaining flour, 1/2 c. flour at a time, until a soft dough is formed that just clears the sides of the bowl, switching to a wooden spoon as necessary if making by hand. 3. Turn out the dough onto a lightly floured work surface and knead until smooth and springy, about 3 minutes, adding only 1 T. flour at a time as necessary to prevent sticking. Place in a greased deep container, turn once to coat the top, and cover with plastic wrap. Let rise at room temperature until doubled in bulk, 1 -1 1/2 hours. 4. Meanwhile, prepare the sweet spice streusel. In a small bowl, combine the sugars, orange zest, cinnamon, ginger, nutmeg, cloves, and flour. Using your fingers or a pastry blender, cut in the butter pieces until coarse crumbs are formed. Alternatively, use a food processor to combine the ingredients. Set aside. 5. Turn out the dough onto the work surface and divide into two pieces, then pat each piece into a long rectangle, about 8 x 12 inches. To make the spiced cinnamon sugar, in a small bowl, combine the brown sugar and spices. Brush the surface of each rectangle lightly with melted butter and sprinkle with half of the cinnamon sugar leaving a 1 inch border around the edges. Starting from the narrow end, roll up jelly-roll fashion to form a fat-loaf shaped. Pinch seam together to seal completely. Slice each log into 6-8 rolls (depending on how big you want them). Place rolls on two greased cookie sheets, and let rise app 45 minutes. Twenty minutes before baking, preheat the oven to 350 degrees. 6. Sprinkle the top of each roll heavily with a portion of the sweet spice streusel. Bake in the center of the preheated oven until the rolls are golden brown, about 30 minutes. Remove to rack to cool. Thanks for the recipe, great stuff!